The U.S. agricultural system is in crisis. Since the 1970s when U.S. farm policy encouraged farmers to overproduce and “get big or get out”, family farmers have struggled just to survive. They are told that biofuels programs like the Renewable Fuel Standard, which requires a certain level of biofuel consumption, will help them stay afloat by increasing both demand for corn and the price farmers are paid. But these biofuels mandates only prop up the industrial agribusiness system. Farmers are not getting the fair prices they need, and rural communities continue to decline. 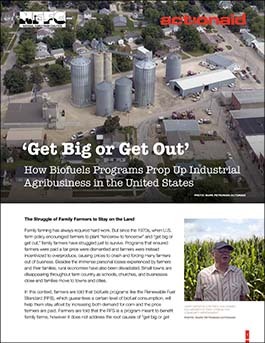 This report examines the impact of agribusiness and biofuels programs on family farmers and rural communities in Iowa, which produces more corn than many countries and has a strong family farm history.